If you have a sewer emergency or sewer related problem, please Call Us First, day or night at (650) 321-0384. Our reporting line is open 24/7. Thank you! 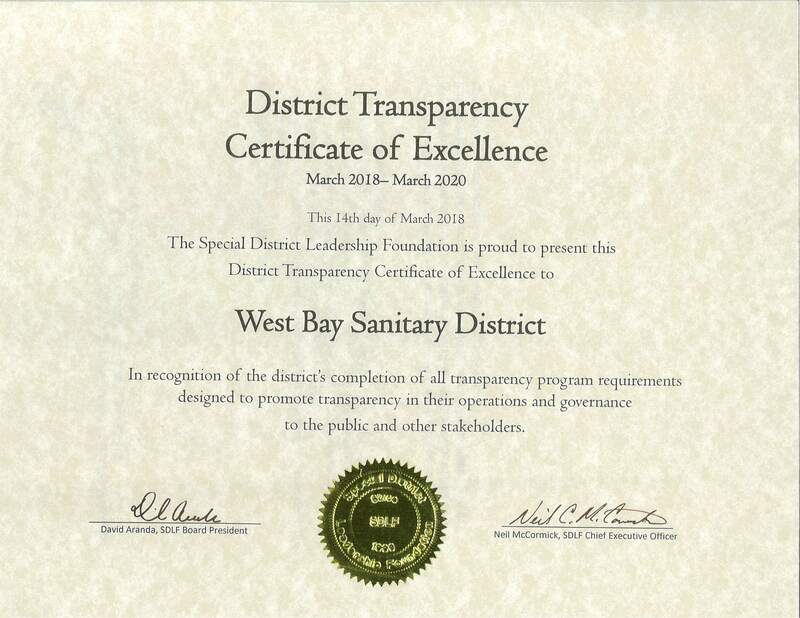 Menlo Park, CA — The West Bay Sanitary District received the District Transparency Certificate of Excellence by the Special District Leadership Foundation (SDLF) in recognition of its outstanding efforts to promote transparency and good governance. 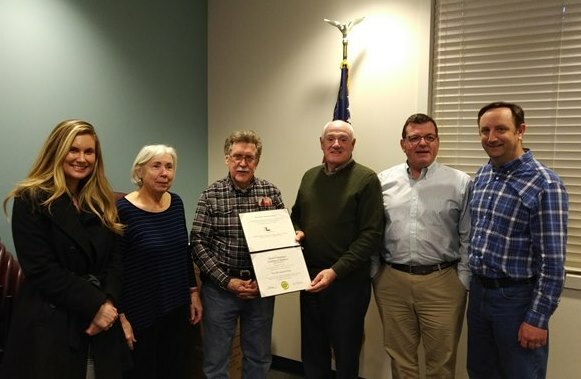 “This award is a testament to West Bay Sanitary District’s commitment to open government,” said Phil Scott, District Manager. “The entire district staff is to be commended for their contributions that empower the public with information and facilitate engagement and oversight.” To receive the award, a special district must demonstrate the completion of essential governance transparency requirements, including conducting ethics training for all board members, properly conducting open and public meetings, and filing financial transactions and compensation reports to the State Controller in a timely manner. West Bay Sanitary District is dedicated to protecting the public health and the environment by providing cost effective sanitary sewer service. West Bay Sanitary District is committed to providing our customers with wastewater disposal services utilizing the highest technical environmental, and safety standards available; to providing the very best customer service; to ensuring the fiscal viability of our District by applying sound business principles and to ensuring the optimum operation of our infrastructure by employing professional maintenance and replacement practices. The SDLF is an independent, non-profit organization formed to promote good governance and best practices among California’s special districts through certification, accreditation, and other recognition programs. Special districts are independent public agencies that deliver core local services to communities, such as water, wastewater treatment, fire protection, parks and recreation, healthcare, sanitation, mosquito abatement, ports, libraries, public cemeteries and more. Districts are established by voters and their funding is approved by voters to meet specific needs through focused service. They can be specially molded to serve large regions or small neighborhoods depending on the need. Click below to view certificate in full size. Copyright © 2019. West Bay Sanitary District.